Want to know more about the lives and works of the Beat poets and their literary descendants? 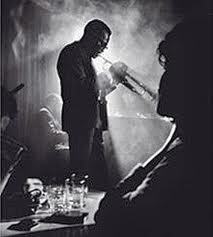 Want to find out more about what exactly was behind everything about to happen in that jazz club and what it meant culturally and poetically? You can make a start by turning to a new book just published by our department’s Scholar in Residence, Dr. Paul Varner. 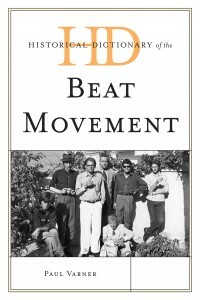 It’s the Historical Dictionary of the Beat Movement (Scarecrow Press 2012). Over the course of 400 pages Dr. Varner’s book covers the Beat movement’s history through a chronology, an introduction essay, an extensive bibliography, and a dictionary section with over 700 cross-referenced entries on significant people, themes, critical issues, and the most significant novels, poems and volumes of poetry and prose that have formed the Beat canon. Along with compiling hundreds of outside sources, Dr. Varner also conducted a considerable amount of original research of his own, which further enriched the book. Dr. Varner has published two previous scholarly volumes under Scarecrow Press. These two books are titled Historical Dictionary of Westerns in Cinema (2008) and Historical Dictionary of Westerns in Literature (2010) and are part of a series of historical dictionaries. We emailed Dr. Varner and asked him a few questions about his book and about all the work he did to compile such a voluminous wealth of knowledge. Q: How long ago did you start working on this book? How long has it taken you to complete it? Dr. Varner: I give myself two years for each of my books, which evidently is standard since both my publishers suggest that time frame. So I finished my last book, on Western fiction, in 2010 and began my book on the Beat Movement immediately. I try to spend the first year in reading and research and the second year in writing. I’ve already begun my next book—on Romanticism in Literature. Q: How much work did you do on this book each day or week? Dr. Varner: Of course, I had two summers to work full-time on the book, but I also try to arrange my teaching schedule during the school year so that I have at least two full days a week to research and write. Q: What was the biggest challenge you faced in writing this book? Dr. Varner: Obviously, there is always the challenge as to what and who to include and exclude in a broad critical survey. But probably the biggest challenge was whether I would limit the scope of the Beat Movement to the early generation of the Beats—the writers who came to prominence in the 1950s—or would I expand to writers and works that came after the 1950s. Most surveys of the Beats confine themselves to the 1950s, to the Beat Generation. I decided to treat the Beats as a Movement that began in the 1950s but which continued into the 1960s and still exerts a powerful influence on postmodern literature right up to the present. After all, Lawrence Ferlinghetti published a poem just a few months ago on the Wall Street Protest Movement and Gary Snyder published a new volume of poetry in 2011. Dr. Varner: My book is part of a series and is intended to serve as a handbook for scholars and students entering into serious academic study of a particular field of literature. My previous two books in the series of Historical Dictionaries have been on Westerns in Cinema and Westerns in Literature. These books survey the scholarship of their fields in general and establish the current scholarship for individual writers and major works. At all turns I push forward and attempt to establish new ways of looking at the literature. So anyone doing serious work in Beat Studies should consult my book. But also anyone interested in the Beats for whatever reason will find much new in my book. Q:How will this book be used? Dr. Varner: My Historical Dictionary of the Beat Movement is a user-friendly handbook ready to be picked up and dipped into for whatever information readers are searching for. It has two lengthy essays surveying the movement and the trends in scholarship, an exhaustive bibliography of primary and secondary works. Then most of the book contains dictionary or encyclopedia type entries on the writers, their individual works, terminology, historical events, geographical places, and all sorts of other information. Major novels and poems get thorough treatments. Dr. Varner’s book on the Historical Dictionary of the Beat Movement is available now, along with the past two volumes of this series from Scarecrow Press. If you are interested in moving beyond the cigarette smoke and getting inside the head of that poet on stage, you can find it on Amazon.com here.